When you hear the term “birth control,” the Pill probably springs to mind, followed by methods that are growing in popularity, like intrauterine devices and the Nexplanon implant. But there's a slew of other options out there, including one that doctors say is popular but often overlooked in birth control conversations: the shot. Rebecca Starck, M.D., an ob/gyn and clinical assistant professor of surgery at Cleveland Clinic Lerner College of Medicine, tells that she tends to prescribe hormonal birth control pills, IUDs, and the implant more often than the shot, but Depo-Provera is among the range of options she discusses with her patients. On the other hand, Jessica Shepherd, M.D., an assistant professor of clinical obstetrics and gynecology and director of minimally invasive gynecology at The University of Illinois College of Medicine at Chicago, tells that Depo-Provera is fairly popular with her patients. “It’s a great option for women looking for some type of long-term reversible contraception, and allows people to have a little more flexibility with their contraceptive management,” she says. 1. You might stop having periods. The most common side effect of the shot is a change in a woman’s bleeding pattern, Jason James, M.D., medical director at Miami's FemCare Ob-Gyn, tells. In the short-term, that can mean you might have irregular periods and spotting. But after a few months, the progesterone in the shot causes your uterine lining to thin, and as a result, your period may go away. However, once you go off the shot, you may have irregular bleeding again as your body eliminates the extra progesterone from your system. 2. After you stop using the shot, it can take some time to get pregnant. Michael Cackovic, M.D., the obstetric director of the maternal cardiac disease in pregnancy program at The Ohio State University Wexner Medical Center, tells that a person’s “return to fertility” can take anywhere from 10 to 22 months after they stop using the shot. “It’s not a good medicine for family planning” if you want to get pregnant soon, he says, in the sense that you can have a pretty much instant return to fertility with options like the Pill. 3. It can mess with your bones. 4. You might start to get headaches. However, Shepherd says this is a potential side effect of pretty much every form of hormonal birth control. “What I would recommend is that if someone experiences a new onset of headaches with starting a new method of birth control, they really should talk to their doctor,” she says. While it's probably just a normal side effect of the birth control, “it could be triggering something or may be exacerbating something that’s already there," Shepherd explains. 5. It won't help your skin the way the Pill can. If you’ve been on a combination estrogen and progesterone birth control pill, you've probably noticed that your skin looks clearer. This is because combination pills tend to help remove excess testosterone in your body that can exacerbate acne. “We often see women on combination birth control pills have an improved complexion,” Starck says. However, progesterone-only methods like the shot don’t impact your skin. It won’t necessarily make your skin worse, Starck says, but it also won’t make it better. 6. You could get bloated. Bloating and stomach cramps are a common initial complaint on the shot, says James. It’s due to the fact that progesterone can slow down your intestines' digestion slightly—but it doesn’t last forever. “These symptoms, like most side effects, tend to improve with time as women become accustomed to the medication,” James says. 7. You could gain some weight. James says that some women mention gaining weight on the shot. 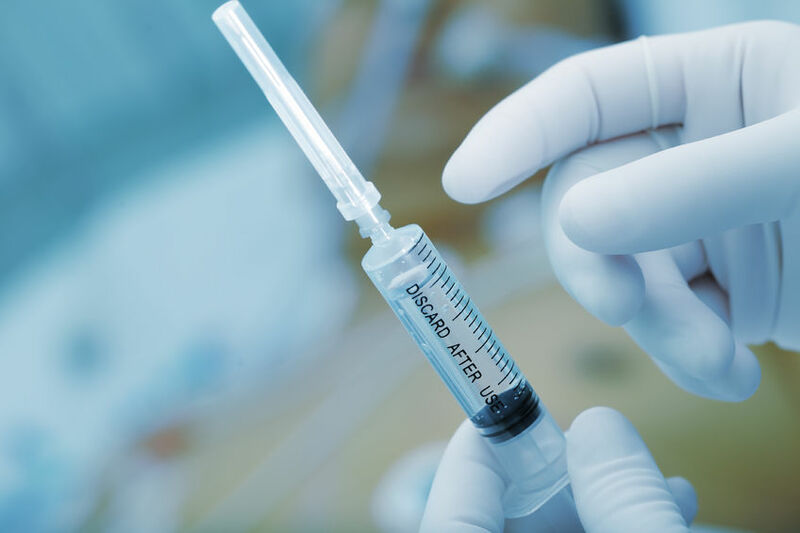 In fact, a 2009 study published in the American Journal of Obstetrics and Gynecology found that Depo-Provera users gained an average of 11 pounds over three years, compared to the three to four pounds gained by women who used other forms of contraception. Of course, using the shot isn’t a guarantee that you’ll gain weight, but it's a potential side effect that causes concern in some people.